Green iguanas can found naturally from Mexico to South America. They are reptiles that spend most of their lives in trees. Iguanas are herbivores, eating mostly leaves, flowers, and fruit. They also excel at doing nothing and conserving energy. Iguanas will spend a great deal of time basking, resting, and watching. An adult green iguana can grow to be up to 6 feet long. Its features include soft spines along its back, a fold of skin under its chin called a dewlap, a large scale below the ear, and a very long tail. Even though they are called green iguanas, they are not always green. They can be green, gray, brown, tan, and many other colors. They can also change colors based upon heat requirements, mood, or stress. A green iguana can make a wonderful pet, but it is not for everyone. Iguanas grow quickly and get quite big. The cage and habitat needed for an iguana five feet long is very large. Housing and providing for a large reptile does require planning and preparation. Iguanas are territorial animals and do not always handle cage mates well. They usually should not be kept in groups. To prevent stress, fights, and possible injuries, having only one iguana in a home is often best. If you are willing to take the time to provide a great home, proper food, and the attention required, an iguana will make a great addition to your home. A pet iguana is a fun animal that is entertaining to watch. An iguana can be a companion that enjoys your attention, touch, and interaction. Everything you need to care for a green iguana. All the foods, treats, and supplements needed to keep your pet healthy. Providing an ideal home for a pet iguana. 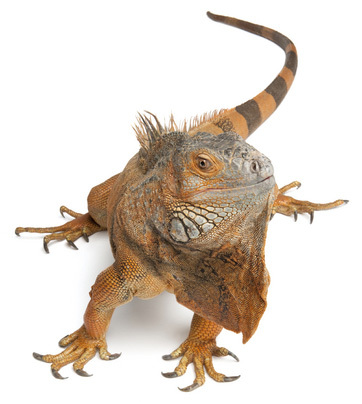 Get the facts about common iguana illnesses and injuries. Information on how to tame a wild or unfriendly iguana. Your pet’s actions and what he is trying to tell you.